Modern humans may have emerged from Africa up to 50,000 years earlier than previously thought, a study suggests. 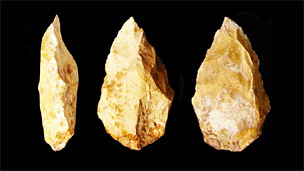 Researchers have uncovered stone tools in the Arabian peninsula that they say were made by modern humans about 125,000 years ago. 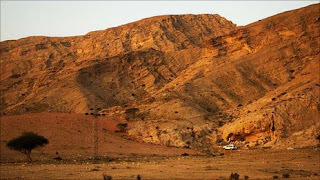 The tools were unearthed at the site of Jebel Faya in the United Arab Emirates, a team reports in the journal Science. The results are controversial: genetic data strongly points to an exodus from Africa 60,000-70,000 years ago. Simon Armitage, from Royal Holloway, University of London, Hans-Peter Uerpmann, from the University of Tuebingen, Germany, and colleagues, uncovered 125,000-year-old stone tools at Jebel Faya which resemble those found in East Africa at roughly the same time period. The authors of the study say the people who made the tools were newcomers in the area with origins on the other side of the Red Sea. The researchers were able to date the tools using a light-based technique, which tells scientists when the stone artefacts were buried. So-called anatomically modern humans are thought to have emerged somewhere in Africa some 200,000 years ago. They later spread out, migrating to other continents where they displaced the indigenous human groups such as the Neanderthals in Europe and the Denisovans in Asia. DNA from the cell's powerhouses - or mitochondria - can be used as a "clock" for reconstructing the timing of human migrations. This is because mitochondrial DNA (mtDNA) accumulates mutations, or changes, at a known rate. Studies of mtDNA had suggested a timing for the "Out of Africa" exodus of 60-70,000 years ago. But scientists behind the latest study argue that the people who made tools at Jebel Faya 125,000 years ago are ancestral to humans living outside Africa today. Professor Uerpmann said the estimates of time using genetic data were "very rough". "The domestic dog was said to be 120,000 years old, and now it is 20,000. You can imagine how variable the genetic dating is," he explained. Commenting on the findings, Professor Chris Stringer, a palaeoanthropologist at London's Natural History Museum, said: "This archaeological work by Armitage and colleagues provides important clues that early modern humans might have dispersed from Africa across Arabia, as far as the Straits of Hormuz, by 120,000 years ago. "This research augments the controversial idea that such populations could have migrated even further across southern Asia, despite conflicting genetic data that such movements only occurred after 60,000 years." The researchers say the toolmakers at Jebel Faya may have reached the Arabian Peninsula at a time when changes in the climate were transforming it from arid desert into a grassland habitat with lakes and rivers. These human groups could later have moved on towards the Persian Gulf, trekking around the Iranian coast and on to South Asia. Indeed, Dr Mike Petraglia at the University of Oxford has uncovered tools in India that he says could have been made by modern humans before 60,000 years ago. Some tools were sandwiched in ash from the eruption of the Toba super-volcano in Indonesia that geologists can date very accurately to 74,000 years ago. However, other researchers suggest that the people living in India at this time could have died out and been replaced by a later wave of humans. Anthropologists already knew of an early foray out of Africa by modern humans. Remains found at Skhul and Qafzeh in Israel date to between 119,000 and 81,000 years ago. But the Skhul and Qafzeh people are generally thought to have died out or retreated south, perhaps because of climatic fluctuations. They subsequently disappear, and their sites are re-occupied by Neanderthals. Professor Stringer said the fact that the tools found at Jebel Faya did not resemble those associated with modern humans at Qafzeh and Skhul hinted at "yet more complexity in the exodus of modern humans from Africa". He posed the question: "Could there have been separate dispersals, one from East Africa into Arabia, and another from North Africa into the Levant?"